The Major Mayhem game franchise is based on a 1980s movie with the same name. The original played like classic arcade games such as Operation Wolf and Dynamite Duke. The sequel plays in a similar way but is not as enjoyable as the original. 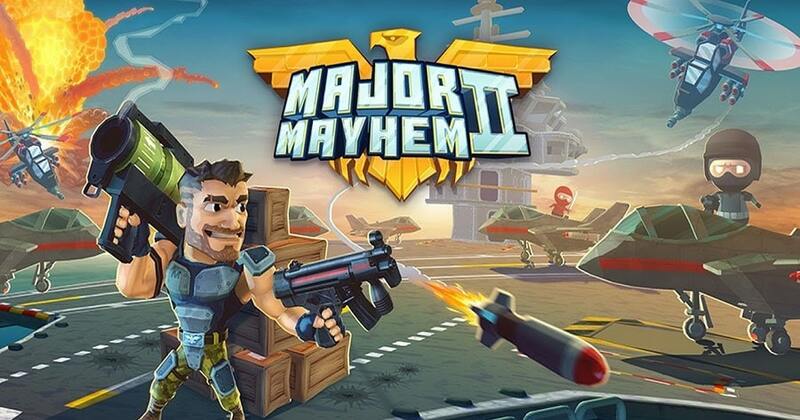 Rocket Jump’s first version of Major Mayhem was fun but Major Mayhem 2 for PC is a disappointment. 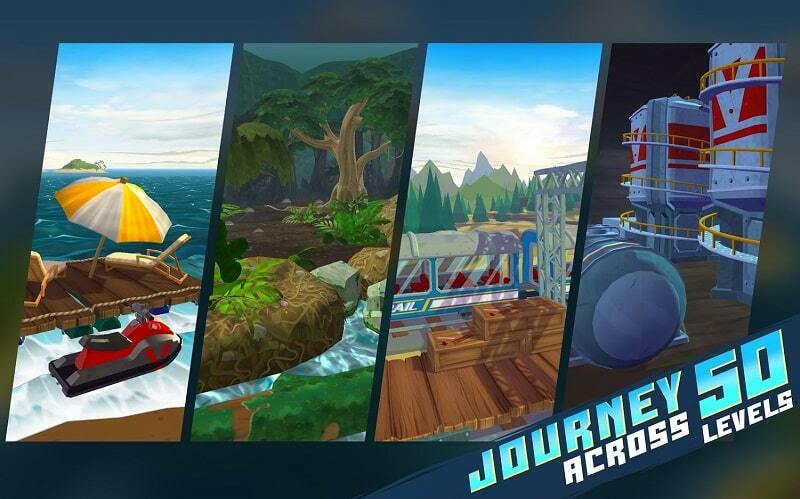 The developers chopped up the innovative formula which made the original a success in order to make room for IAPs. The other major difference is in the character sizes. The original had small characters but the sequel’s characters are supersized to the point of absurdity. They can barely fit behind cover while shooting. A life budget limits how long you can play for. This budget consists of action points and each level costs a certain number of points to play through or even attempt. The budget has a limit of ten points which will refill on their own while you’re not playing but you can buy a few more if you don’t want to wait. The cost for attempting each level goes up as you progress. The cost increases after every ten levels however the game does not give you a way to increase your maximum number of action points. This model actually punishes you for playing for longer. Major Mayhem 2 also removed all of the features that made levels worth replaying. There are no more secondary objectives such as playing through with a single weapon. The only reason to replay a given level is so that you can get a perfect 3-star score. The game starts slow but gets interesting once you acquire a few cool weapons. They are very powerful weapons that are satisfying to use against enemies. The only issue is in how hard those weapons are to find. New weapons are crafted using blueprints that you pick up. The model for the blueprints was not well thought out because you can end up with more than ten blueprints for a machine gun and barely any for a rocket launcher. Once you have the blueprints then you still need to use coins to build them. The graphics are the only good upgrade from the original. The number of action points that you have is sorely limited. It makes playing the earlier levels especially tedious and is a horrible way of forcing players to spend real-world currency. They might as well have made the game premium instead of freemium. The lack of customization options makes the IAPs even less appealing. You’ll have no custom costumes or cool soundtracks to show for making the purchases. Just a little extra playing time. Rocket Jump took a fun game and ruined it with horrible monetization policies. Every part of this game can be sped up or improved with an IAP and the developers are not shy with the prompts. You can have some fun without making the purchases but you’ll be limited to very short spurts. 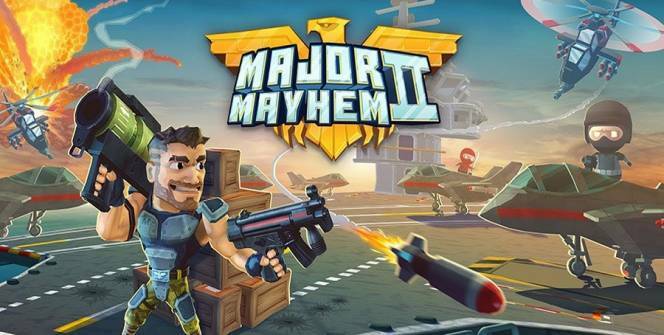 Major Mayhem 2 could have been a great game but Rocket Jump decided that IAPs are more important that a fun gaming experience. Follow the instructions below, it’s really easy and it takes about 5-10 minutes to run the game. Sometimes when playing Major Mayhem 2, bluestacks ask you fee to pay but gives you option to download some apps. Every time it asks you just select “Install apps” and continue using it free. I hope you enjoyed this article, please rate and share. If you have problems running Major Mayhem 2 on your desktop or any other issues, leave a comment below. Want to Try a Similar Game? Copyright © 2019 GamesHunters.com. All rights reserved.